In ancient times, Ireland was renowned for the skill of its physicians, particularly their herbal-lore. Mythology tells us not just of famous battles, brave warriors and tragic love stories, but tales of miraculous healing, too. Of all the Irish Gods, the most well-known and beloved of them all were those who practised healing, such as Brigid, Lugh, Dian-Cecht and his son Miach, and daughter Airmid. Dian-Cecht came to Ireland with the Tuatha de Denann invasion over 4000 years ago as King Nuada’s physician. When Nuada’s arm was struck off in battle, Dian-Cecht replaced it with a fully working one of silver. Later, his son, Miach, was able to cover the silver arm with skin, and thus restored and unblemished, Nuada was able to return to his position as High King of the Denann people. It seems impossible to us now that such a feat could have been performed in primitive times, and so the story has been dismissed as pure fantasy. I don’t believe that. We are discovering more and more that ancient civilisations held the key to knowledge we cannot comprehend today. When the Red Branch Knights of Ulster rode into battle with Cúchullain, they were accompanied by a medical corps. Each one of them carried at their waist a bag known as a lés (pronounced lace), which was full of medicines, ointments and medical implements. Winter willows in my garden. The bark of willow trees contains large amounts of salicylic acid, which is the active metabolite of aspirin. Willow bark has been used for millennia as an effective pain reliever and fever reducer. Historically, as with most aspects of ancient Irish society, the role of the physician was governed by the Brehon Law. If someone was injured by another, the victim was entitled to be paid compensation by his aggressor. Likewise, if a doctor failed to heal his patient, he was required to pay a similar compensation, and return any fee paid by the patient. The early Irish even had hospitals in which to treat their sick and wounded. The Tain refers to a hospital at Emain Macha (Navan Fort, near Amagh) known as Bróinbheg (pronounced brone-ver-rig), which means ‘House of Sorrows’, a name which in my mind doesn’t bode well; I wouldn’t want to be taken in there! The Brehon Law had very strict rules pertaining to hospitals; they were required to be kept clean and well-ventilated, had to have four open doors, and a stream running through the centre of the floorspace. Patients were expected to pay for their food, medicines and physician’s services, so it is quite likely that only the wealthy ever visited a hospital for their healing. As with Nuada and Dian-Cecht, kings and nobles employed their own personal physicians, although his services weren’t always exclusive to his employer. He was provided with land and a home at the expense of his employer, and was also paid for his services. In those times, the role of a physician was a hereditary one. He passed down his skills and knowledge to his offspring, and often to apprentices living with the family. In later years, this wealth of information was written down in manuscripts and books. The most famous of these is the Book of the O’Lees, which has quite an intriguing history. Of course, medical services were not just required as a result of injury from battle. Disease spread like wildfire through communities which were rapidly growing, following on from the Neolithic farming revolution. Plague was common. Plague victims would be buried in specially marked graveyards, which Cormac’s Glossary calls tamhlacht, meaning ‘plague grave’. Tallaght near Dublin is named after a tamhlacht; it is said that here nine thousand Parthalonians were buried after they all died from plague within a week. The Partholonians were the second wave of invaders said to have arrived in Ireland three hundred or so years after the Great Flood when the island was still uninhabited. It was believed that disease could not travel over the sea further than nine waves distance, a thought which persisted into Christian times. This is why during times of epidemic people fled to safety on small coastal islands, or established colonies and hospitals there for the afflicted. King Conchobar mac Nessa had a wound stitched in his head with thread of gold to match his golden hair. Use suction to remove infection. Female physician, Bebinn, drew out poison from the leg of Caoilte of the Fianna, using two tubes called fedan. This technique was called ‘cupping’. She also prepared five medicines for him by steeping herbs in water, then administering them to him individually over a period of time, until his full health was restored. Warrior-woman and teacher, Scathach, gave a sleeping potion to Cuchullain to prevent him from going into battle. It was said to be so strong, that a normal man would have slept for twenty four hours. Cuchullain, of course, awoke only after one. Grainne administered one to the guests at her wedding to Fionn mac Cumhall by slipping it into the wine supply, so that everyone but her lover, Diarmuid, fell asleep. Although these examples are not medical ones, they do imply that making such medicines was common knowledge. Early Irish sweat-houses look like little stone beehives with a low doorway, and can still be seen dotted around the landscape today, although their true purpose is one of debate. They were called Tigh nAlluis (pronounced Tee-noll-ish). A fire would be lit inside, in which stones were heated. The ashes would be scraped out, and water sprinkled onto the stones to produce a heavy vapour. The patient would crawl inside, and the door sealed. Afterwards, he would be plunged into a trough of cold water and then emerge to be rubbed till warm and dry again. This treatment would be repeated until the patient was pronounced cured. We have already learned that Dian-Cecht fashioned a fully working arm of silver for his King, Nuada. Inevitably, attachment would have required some form of surgery. (Hopefully, his sleeping draught was more effective than Cuchullain’s). In AD 637, following a head injury received at the Battle of Moyrath, a young chieftain named Cennfaeladh was taken to receive treatment from Bricin at the School of Tomregan in Co Cavan (county where I live; Tomregan is near Ballyconnel, I feel a field-trip coming on!). It is said he was healed by trepanning, a surgical intervention which involves drilling a hole into the skull, usually to release pressure. Evidence of this has been found on skulls dating back to Neolithic times. Courtesy of Wikipedia. Neolithic girl’s skull. The perimeter of the hole in the skull is rounded off by ingrowth of new bony tissue, indicating that the patient survived the operation. Google Celtic healing, however, and you’ll encounter something quite different altogether. Nowadays, it’s called Bio Energy Therapy, but it is quite reminiscent to what most of us have heard of as a far eastern treatment called Reiki. Reiki is based on releasing blocked energy in the body through zones known as ‘chakra’. It is a gentle yet powerful non-invasive treatment still practised today which is said to be able to cure a whole range of ills and promote relaxation and a sense of well-being. I have had amazing and powerful personal experiences of Reiki, so much so that I now practise it myself. Fancy a treatment, anyone? You won’t regret it! In fact, one of the hand positions (cupped over the eyes, and said to enhance the third eye) is very similar to how Cormaic described the beginning of the ritual of Imbas Forosnai. Which totally blew my mind when I realised! In Ireland, the chakras were known as ‘doors’ through which energy in the form of light was brought into the body to enable healing via the ritual of Imbas Forosnai. Whereas the energy in Reiki is channeled from the universal life force through the head, in Celtic healing it is drawn from the earth. This mystical, spiritual aspect of healing can also be found in mythology. Fionn mac Cumhall was said to have acquired it by eating the Salmon of Knowledge. After Diarmuid eloped with Grainne, a reconciliation was organised which involved a boar hunt. Diarmuid was mortally wounded by the boar, but could have been saved by receiving a drink of water from Fionn’s healing hands. Unable to forgive Diarmuid for his misdemeanour, twice Fionn let the water drain through his fingers. Finally he relented, but by the time he returned with water cupped in his hands, Diarmuid was dead. Finally, I could not end this post without mentioning Holy Wells. Ireland is riddled with them, named after various saints, but most often attributed to Brigid or Patrick. They are usually associated with some form of healing; often each well is devoted to a particular ailment, such as eye complaints, or warts, and such like. The afflicted must circle the well deiseal-wise, while reciting certain prayers at prayer stations situated along the route. Although adopted by Christianity, these holy wells were undoubtedly pagan in origin, and known as Wells of Healing. The Well of Healing at Moytura is said to be located beneath a large cairn at Heapstown. Heapstown Cairn, beneath which is said to be the Healing Well of the Danann. 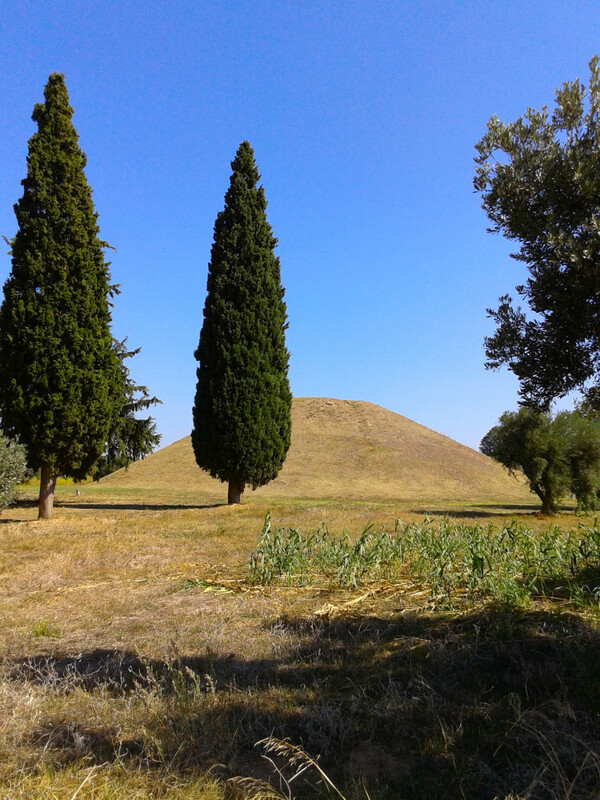 The Well of Healing at Moytura reminded me of the Tumulus in Marathon (https://nicholasrossis.files.wordpress.com/2014/11/marathontumulus2.jpg). Wow that looks really impressive! Have you been there? It looks very similar to many of our grass grown mounds. I think the sweat lodges are pretty much the same thing! Sorry Nick… I did see that post, but I didnt realise it was the same place. I think at the time Ivasked you to write more posts like that, didnt I? Amazing how similar it is to some of our mounds. Hello Ali, I came to thank you for finding and following my own blog, but then I started reading this posting and became so engrossed in it. I learned so much. I never knew half the things you mentioned. I’d love to read more. I look forward to following and exploring your blog, too. Best wishes, Mary. This post is amazing. I learned a lot from it. I have been interested into magical healing of other cultures since I was a kid. Raised in a traditional and superstitious Chinese family, I learned about the magical plants and ancient Chinese alchemy practiced by Taoist priest. It is really hard to digest, literally out of this world. It is heavily metaphysics and related to geomancy, cosmology and other celestial stuff. I love your imagination! That conjured up a lovely image for me too. You will have to tell us more about your Chinese heritage on your blog, I know very little about it, but would love to learn more. I am planning to write more about supernatural creatures this year. Chinese magical bestiary is more than just serpent-like dragons! LOL!!! Great! I look forward to it! Yet another fabulous post, Ali. Keep them coming. You’re making the history and mythology I waded through in school come alive! Thanks! Thanks Tara! I think its not taught imaginatively enough in schools, if its taught at all. I’d love to go into schools to talk about it… at least, thats my plan! You definitely should… or even think about writing for textbooks – show people how it should be done? I have a post coming up on what one particular Irish schoolbook did to one of my favourite stories. It was complete annihilation… sort of hilarious, but sad at the same time! I’ll look forward to teading that, Tara! Which story is it? I’ve just written a short story about Diarmuid and Graine this morning!!! Wow that’s weird! Lol! What a shame though… kids love all these stories, thats a sure way to turn them off for life! Thanks Mishka! Its certainly inspired me to go looking for the area in Ballyconnel where your man recieved his trepanning! Its not that far from here. Theres a fascinating story behind it, but Ill save it for another post! Fascinating blog post! Full of great info and easy to read. I reblogged it. Hi Gayle, thank you very much! I’m visiting from Gayle’s reblog. I loved reading and learning through you Ali! Irish history is a favorite subject. I am also impressed by your mention of Reiki, because I’m a master teacher and practitioner. It’s lovely to meet you, as well. I can’t say enough good things about Reiki. I bet the right time for you to learn it will present itself in its own due course. Thank you. You are not the first to say that to me! Lol! Then I stand in good company! For anyone who loves historical romance, especially when it contains elements of herb lore and mystical places in the British Isles, then Ali Isaac Storyteller is a blog worth visiting again and again. Thanks Barb, glad you enjoyed it! Wonderful post, Ali! Well argued, too. 🙂 Sometime I will tell you about my experiences with healing through hands. It is true, what happens is energy is channeled through a person’s hands in the form of light, and the person doing the healing works with chakras both to remove blocks in energy from a person and to create a balance within a person so their systems get stabilized and they remain centered. In my experience, when this happened to me, it was very important that I stay grounded and in contact with earth energy. I think depending on what needs healing, you can either place your hands directly on a person and shine light through them or hold your hands over the person. And it really works! I mean I have never been successful at it, but was successfully healed a couple times this way. Oh and I’ve always wanted to learn more about the bags of herbs I know some people used to carry with them, especially druids. I’m so glad you mentioned it! I wonder… could we learn this knowledge again? Why not Éilis? I dont know anything more myself, but love how organised it all was. I mever really considered it before, but ancient physicians were skilled in things like amputation, for example. I guess they had to be, they must have had to do it a lot after battles. No wonder they were so forward thinking when it came to looking after the disabled… most of them were probably warriors who lost limbs, and therefore nobles as well. Tkanks Éilis! I thought this might appeal to you! I was delighted to find that there was an Irish Celtic way of working with life force energy for healing. I had an experience with Reiki recently and want to explore that more. And I’d love to hear about your experiences! Love your posts! Thanks for the great information; my contemporary fantasy is based on Irish mythology, and I find your posts fascinating. Hi Julie. I never answered your comment the other day, so sorry! These posts arose out of my research for my books, which could also be described as contemporary fantasy, and like you, are based on Irish mythology. I couldnt put everything into my books, so I decided to write about it for my blogs. Fortunately, there are many like minded people out there who seem to enjoy it. I would love to hear more about your book. I will hop over to your blov this pm when I have more time… kids are home, and music lessons are about to start… I am the taxi lol! Fascinating stuff Ali. With the tribal battles being waged endlessly the ancient physicians wouldn’t have been short of practice. The old healing wells are a direct connection to the past aren’t they? And they are still held in veneration by many. I’m not sure St Gobnait’s at Ballyvourney counts as a healing well but it is still very popular with locals and visitors from further afield. Hi Roy. Sorry for the late reply. I wanted to check out St Gobnait first. She sounds fascinating! Apparrantly she kept bees and used the honey for healing, and she saved the local people from plague… dont know how though. You’re right, she did have a holy well but its now dried up and no one knows where it was. Look for the white stag! Thanks for teaching me another story! Do you live near there? Hi Ali, the well is still going strong, near to her grave. Very well visited too with all the votive offerings. (That might be a later, imposter well of course 🙂 ) Yes St Gobnait was certainly an interesting lady. No I’ve only visited the once though I know Cork and Kerry pretty well at this stage. I live in Jersey. Oh so there is a well there still? I dont really know that area very well, but am planning to head down that way this year. Some of the legends of that area will feature in my new book, so I have to go and get a feel for them, visit the associated places… cant wait! You always have such interesting things. I really enjoy these posts. Thanks Craig! Its interesting to me, I love that it is to others too.